Another chilling day here in southeast Kansas – our weather has been yo-yoing as many areas have experienced this odd winter. They had predicted 3-6 inches of snow, though we barely received an inch by the looks of it. This card is filled with plants that I have raised and know to bloom in summer, so it seems strangely warm to me. Yet, the meaning of courage and getting beyond past mistakes so they don’t hold us back should speak to many I know right now. Take heed of the meaning, but don’t forget the warm behind it. Blessing and love to you all. 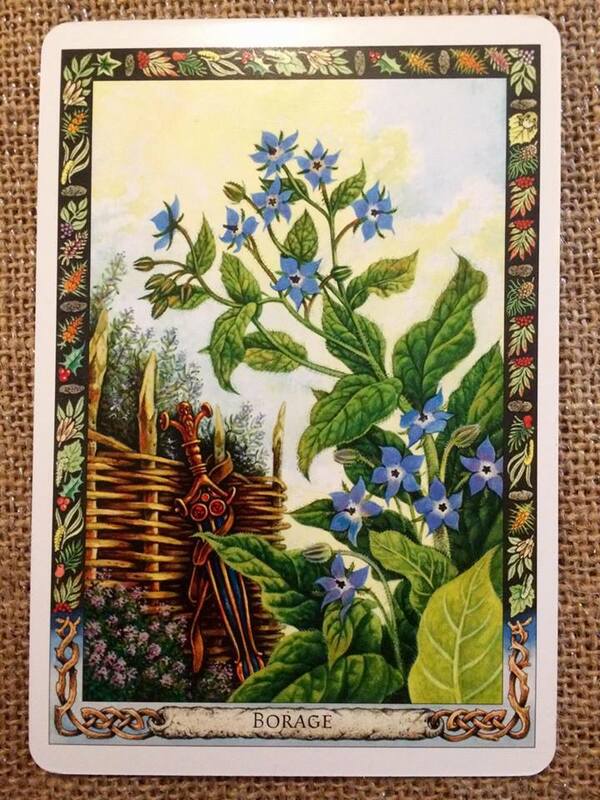 The card shows Borage in flower beside a Celtic dagger, which is in its dagger, hanging from a palisade of coppiced Hazel. It is Lughnassadh, in high summer, the time of traditional games and contests. Thyme and Rosemary are in flower too, Thyme beside the scabbard; Rosemary behind the palisade. Meaning: Borage (Borrach) has been associated with courage since ancient days. If you have chosen this card it may be that this is the quality you need to draw upon at this time. True courage requires a strong and generous heart, and this involves looking beyond your own needs to perceive the greater good of thosearound you. This may mean you need to be courageous in standing up for someone who is weaker than you or who needs your protection, or it may mean sticking your head above the parapet to make a stand for what you believe is right.To be courageous and daring, you must also be able to forget. If you hold every eventuality in mind, you will never act, and being courageous often require a magnanimity that forgets personal slights or errors in judgement. Going beyond judgement or recrimination, true courage is a brave open-heartedness that restores our confidence in human nature, bringing with it joy and happiness. On the flip side, while there is a courage that lies in action and fighting for what you believe is right, there is another kind of courage that is less flamboyant and outward. Sometimes it takes more courage to be still and not to act than to take a stand and react openly to a situation. Sadness can come into our lives for many reasons and there is much suffering in the world. If you have chosen this card, it may mean that you are coming to terms with the suffering of life, and Borage urges you to “take heart” – to know that however difficult life appears to be, your heart and soul are growing strong through your experience of being in the world, with all the pain and hardship this might involve. Caution can sometimes arise out of fear or cowardice, but it is also often wise to be cautious, avoiding impulsive decisions or actions that appear to be courageous but which, in reality, are based on bravado. Choosing this card may also simply indicate that you have forgotten something important. Rosemary, which grows beside Borage in the card, has a reputation for enhancing memory – it might be wise to start drinking rosemary tea!